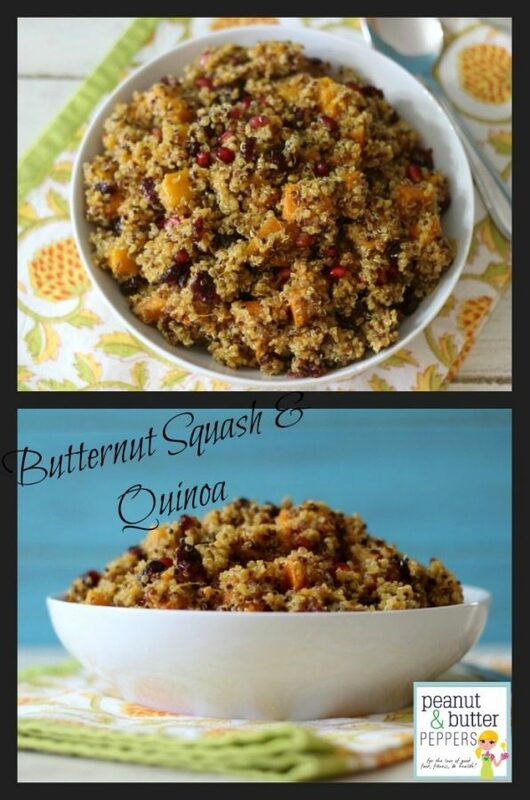 I have been craving butternut squash this past week. I went to Panera Bread and had their Autumn Soup and that was all I needed. Well what I mean is, I needed more. So I headed off to Trader Joe’s and bought 2 pounds of butternut squash. Yum! I thought I would make a side dish that is perfect for serving at Thanksgiving. Not only is it delicious, but it is gluten-free, vegan and dairy free. Perfect for those guests who have a tolerant to certain foods. My recipe is super easy to make and takes about 45 minutes total time. 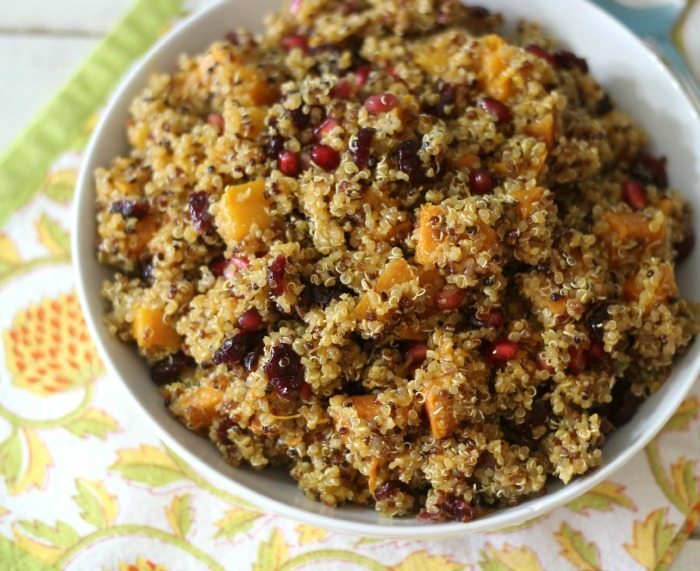 It is made with roasted butternut squash, cranberries, pomegranate arils and flavored with a champagne vinaigrette. Of course I tossed it in quinoa that was cooked in vegetable broth. I love these kind of dishes and if you have left over it freezes well too. Just add a serving size, which is 1 cup to a freezer safe bag and just open the corner and microwave for 3 minutes. So now you have the perfect side dish to accompany any meal. It also makes for a nice quick-lunch too. 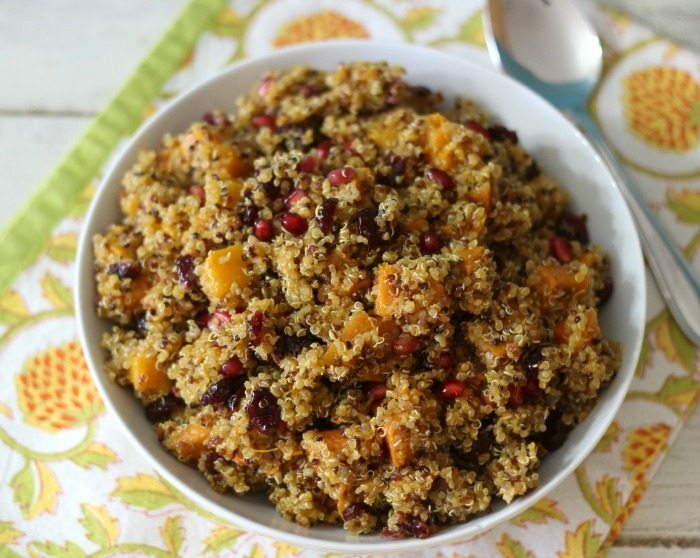 I was going to add candied almonds to the recipe, but since quinoa has a nutty flavor I used pomegranate arils for a little bit of crunch and flavor. 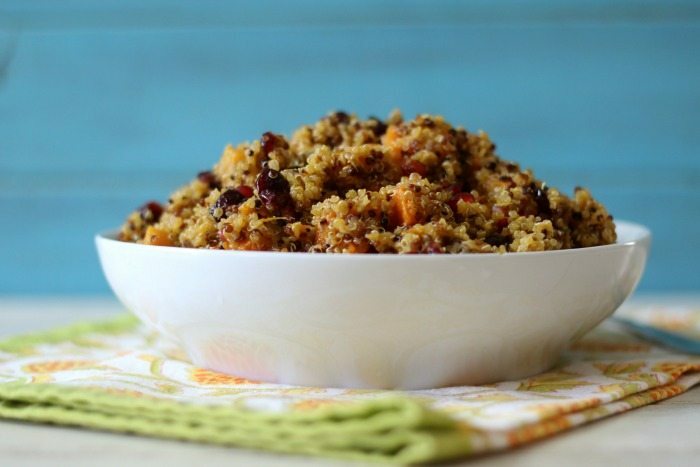 If you’re not a fan of quinoa, you can always use wild rice instead. I have had this recipe with both, and both are just as delicious as the other. It just all depends on what you like. 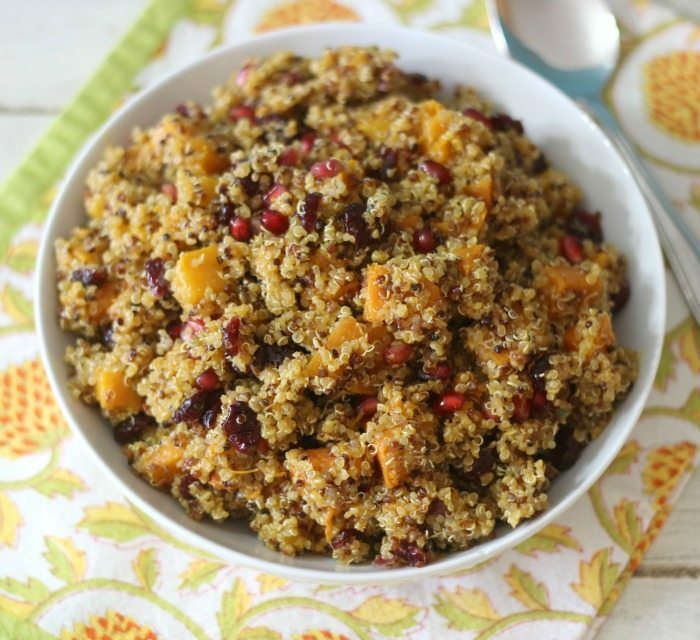 Roasted butternut squash tossed in quinoa with cranberries and pomegranate flavored with a champagne vinegar dressing. Line a baking sheet with aluminium foil, sprayed with cooking spray. In a large pot; bring vegetable broth to a boil. Add quinoa; mix with a fork and cover and simmer for about 15 minutes or until broth is evaporated. Fluff with fork. 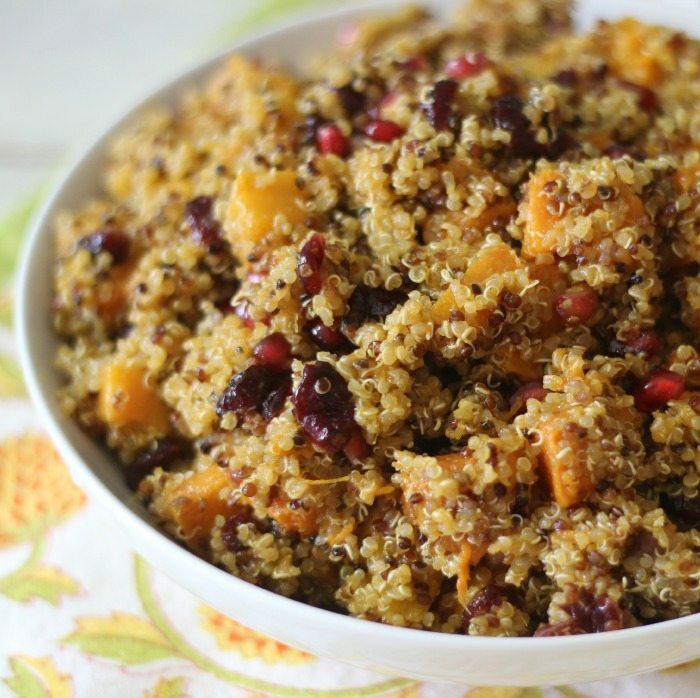 Add quinoa to a bowl; stir in butternut squash, cranberries and pomegranate arils; mix until well combined. In a small bowl; whisk together olive oil, champagne vinegar until well combined. Pour over quinoa. You can use wild rice instead of quinoa if desired. I love-making dishes like this. I just wish my Husband liked it. He is not a fan of butternut squash or quinoa. I think he’ crazy! !